ESD Personnel Grounding products are vital safeguarding elements while using static sensitive electronic devices in production zones. Backed by a team of experienced workforce, we have been able to design and manufacture a wide range of ESD Grounding. These products are Personnel Grounding Products, Work Surface Grounding Products and Common Point Ground Products that are manufactured using latest technology ensuring optimum performance and durability. The entire range is further, tested on various quality parameters that assure us of the quality of these Groundings. The above mentioned range helps avoid ESD and also ensures protection of vital electronic devices. 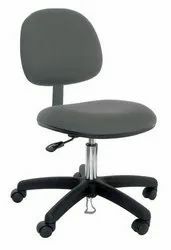 We offer a wide range of ESD Chairs that are designed for discharge the accumulated electrical charges for the operator during critical electronic assembly. Available in blue and black colors, these Chairs are available in dimensions 430 x 400mm (chair seat); 400 x 300mm (chair back) and height between 440 and 600mm. Surface resistance: 103-106? Or 106-109? 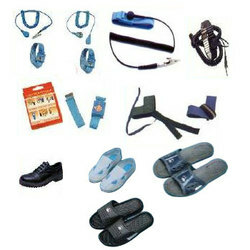 We offer a wide range of Personnel Grounding Products that includes Elastic Wrist Strap, Metal Expansion Wrist Strap, ESD Heel Straps, ESD Shoe, ESD Safety Shoe and ESD Slipper. Manufactured with latest technology, these products are appreciated for their durable and reliable performance. We are also engaged in the sphere of manufacturing and exporting a wide range of Work Surface Grounding Products that are available in various models such as GC 2B, GC 2B, GC I GC and GC 2BL / GC5BL. 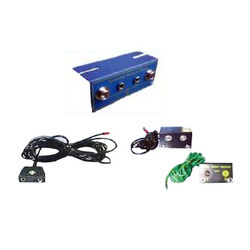 Our company has also specialized in the field of manufacturing a wide range of Common Point Ground Products that includes Common point Ground-1, Dual Bench mount Ground-1 and Dual Bench mount Ground-2. Leveraging on our research work, we have been able to manufacture durable and reliable range of these Ground Products that have been appreciated all over the world. ESD GROUNDABLE NON WOVEN SHOE COVERS are Made from Automatic Machine with Conductive Ribbon/Strip stitched on Bottom for Earthing of Body..